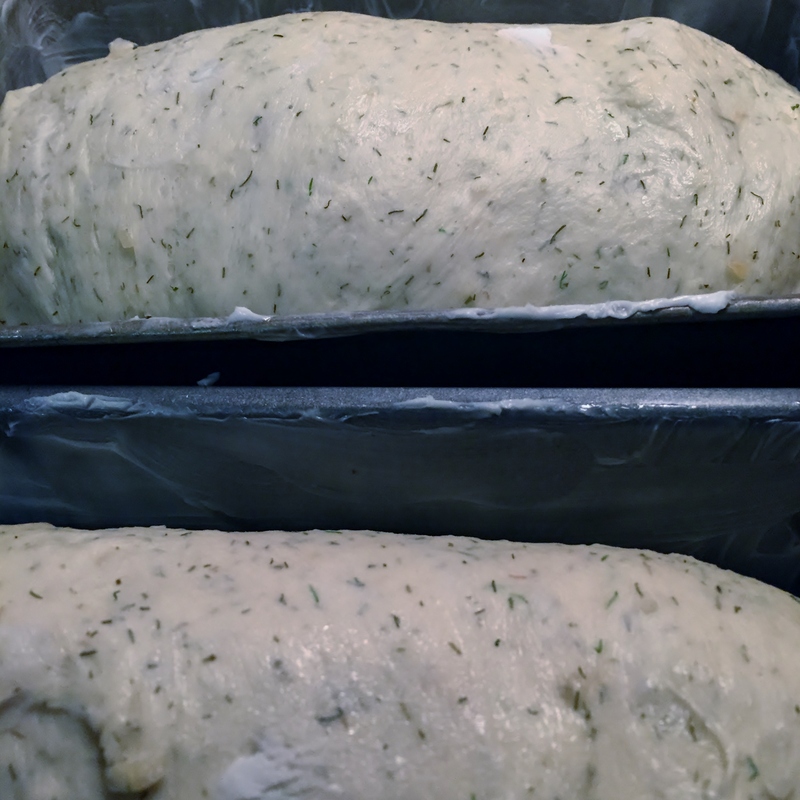 I decided I have time this evening to bake another “gifting loaf.” This time it will be Fresh dill bread with onions and cream cheese. I have started growing my own herbs on the back porch and thought this would be a good opportunity to harvest my dill. I am really looking forward to the smell of this one, it is bound to be incredible. I have also decided to mix and knead this in the machine, but I will bake it in 2 loaf pans in the oven. (I will note now that the dough was looking really stiff, so I added another tablespoon of water. This may work fine, or I may have shot myself in the foot.) I think it will be alright. The dough cycle has finished. I am making two different sized loaves. After greasing my loaf pans, I shaped the dough, covered the pans and set a timer for 1 hour. In the original recipe, Ms. Hensperger states that this is a slow rising dough, so while the standard final rise usually takes about an hour, I figure this may take a little longer. I will check it at 1 hour, and add on more rising time if necessary. After the first hour, both loaves had risen well, but I decided to give them another 15 minutes and let the oven preheat to 375 degrees. Once the oven was up to temperature, I put the larger loaf in to bake for 10 minutes. While that was getting started, I kept the smaller loaf covered so it would stay nice and warm, and continue to rise. After the time was up put the smaller loaf in with the larger and reset my timer for 20 minutes. 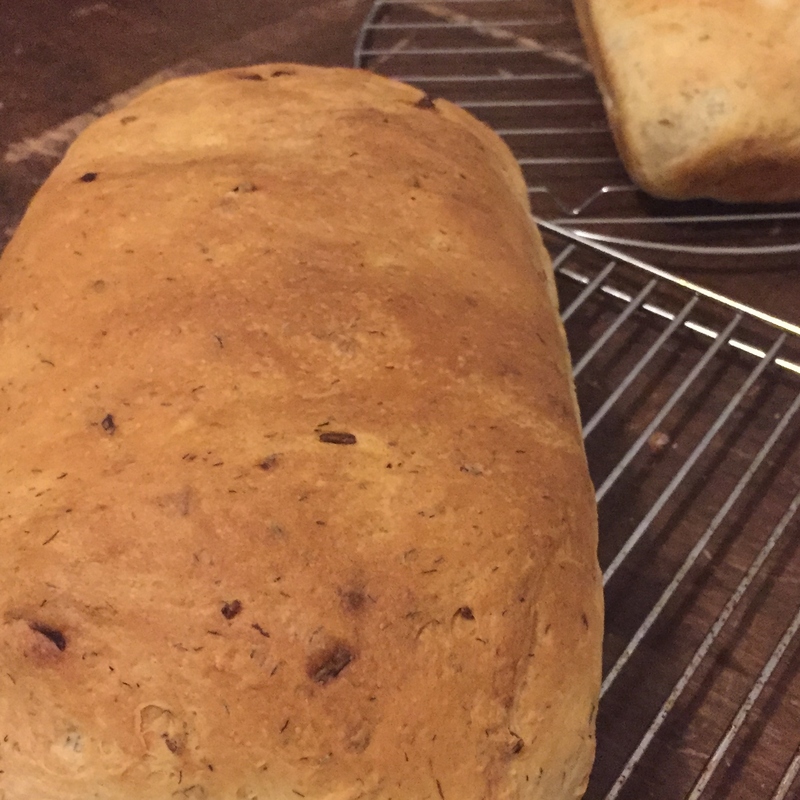 When the loaves were finished baking, I immediately removed them from the pans and set them on racks to cool completely before tightly wrapping them and putting them in the freezer. They really do smell incredible and you can see the bits of dill and onion on the surface of the bread. My freezer is nearly full of bread now. I should hold off baking any more “gift” loaves until I see my friends next weekend. I think you have lucky friends. This sounds terrific.